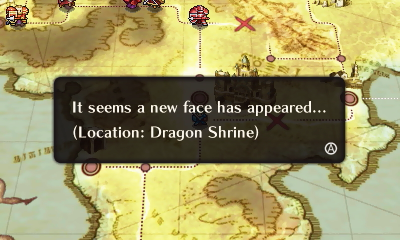 StreetPass functionality in Echoes is fairly basic compared to previous games. After passing another player, you will swap Profile cards and there’s a chance of receiving a present or gossip. 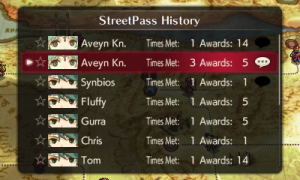 To enable StreetPass communications in-game, you must go to Connect – StreetPass History while on the world map menu. If you haven’t yet enabled StreetPass, the game will ask you to do so. Once StreetPass has been enabled for Echoes, you merely need to carry your 3DS or 2DS with you and hope you bump into somebody doing the same. This is easier in busy towns or during big gaming-related events. StreetPass communication occurs automatically as long as your 3DS or 2DS is in sleep mode or not in Local Wireless mode. Also, if you have an older 3DS model, your wireless switch must be on; for newer models, “Wireless Communication/NFC” must be enabled via the HOME Menu Settings. You can check your HOME Menu Notifications or the in-game StreetPass History to determine if you have received an Echoes StreetPass tag. 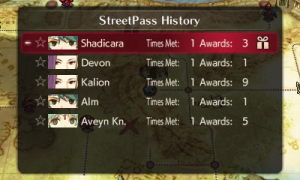 Having tagged a fellow Echoes player, you will find their Profile card in your StreetPass history. From here, you can view their Profile similar to the Global Rankings. The main difference is that you can favourite profiles. In addition, towards the very right of the profile list, there may be one of two icons: a present box or a speech bubble (white or greyed out). If it’s not a greyed out speech bubble, there will be an additional option when you select the corresponding profile. If you get a present, there’s a 85% chance of there being no item. Should that happen–and there’s a very high chance (72.25% chance) of it happening–no icon appears. Gossip is further divided into two categories. The items you may find differ depending on if you receive them as a present or if you find them from a treasure chest. 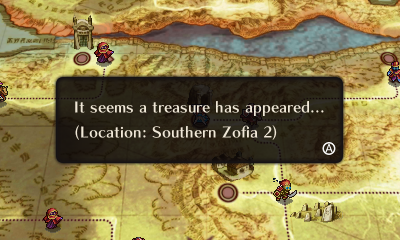 In general, rarer items can be found via treasure chests. However the chance of finding a treasure chest is fairly low, equal to 15% x 40% = 6%. Meanwhile, the chance of receiving an item as a present is equal to 85% x 15% = 12.75%. To further understand the futility, the chance of getting an item with a rarity of S is approximately equal to 0.5% x 6% = 0.03%. Which isn’t actually that bad assuming you can StreetPass many Echoes players.